Suffering from fever, chills, diarrhea, pain in stomach, nausea and vomiting? It can be stomach flu. Stomach flu or medically known as gastroenteritis is an infection in the stomach and intestines. Virus or bacteria are the main reasons for the cause of stomach flu. The virus or bacteria might have contracted from food which is not cooked properly or in condition with poor hygiene. If you are observing blood in your stool or vomiting, fever more than 101 Fahrenheit, extreme lethargy, confusion or altered mental status then it is time to consult a doctor right away. This can be caused due to chronic dehydration. If you don’t have these severe complications then the stomach flu will go on its own within 10 days. There is no cure for stomach flu but its symptoms can be reduced to a maximum extent with simple home remedies. Though there are many remedies to treat stomach flu, in this article we will discuss on the effectiveness of ginger. Is Ginger Good for Stomach Flu? Ginger contains antiviral properties which will fight off the virus causing the stomach flu. It helps in digestion and gives relief from vomiting, nausea, bloating and abdominal cramps. It helps in reducing the frequency of loosening the stools. The active components present in ginger protect the inner lining of the stomach. The antioxidants present in ginger help your body to get rid of the virus itself. 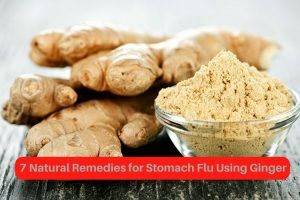 How to Use Ginger for Treating Stomach Flu? We have provided a detail description of different methods to treat stomach flu at home using ginger. You can use any one of them to reduce the symptoms of stomach flu. Take a small piece of ginger root and chew it. Repeat it several times day until you feel better. The ginger tea helps in soothing the muscles in stomach and intestines which helps in reducing the pain and discomfort caused by stomach flu. Chop ginger root into fine pieces. Add 1 teaspoon of chopped ginger root and 1.5 cups of hot water. Strain the tea and sip it slowly. Repeat the process few times a day. For taste, you can add 1 teaspoon of honey. Cinnamon is known to treat many stomach ailments including stomach flu. It contains antiviral, antifungal and antibacterial properties. Extract juice from fresh ginger root. Mix 2 teaspoons of ginger juice and a pinch of cinnamon. Combine 2 teaspoons of ginger juice and 1 teaspoon of honey. Repeat this process 2 – 3 times a day. Alternatively, you can add this mixture into a glass of warm water and drink it. Consumption of healthy ginger ale soothes the digestive disturbances, alleviates nausea, reduces fever and stimulates the circulatory system. Into a saucepan, add 1 1/2 cups of ginger and 2 cups of water. Bring the mixture to boil, simmer for 20 minutes and strain. Into a saucepan, add 1 cup of sugar and 1 cup of water. Boil the mixture to make syrup. Combine 1/2 cup of ginger water, 1/3 cup of sugar syrup and 1/2 cup of club soda. Squeeze juice of 1 lemon and stir well. Enjoy ginger ale throughout the day slowly to get relief from the stomach flu. The ginger shot is rich in vitamin C, antioxidants, and antiviral power. Apart from providing relief from stomach flu, it gives a boost to your energy. Combine 1/2 inch grated ginger, 1/2 cup freshly squeezed orange juice, 2 tablespoons of manuka honey and a pinch of turmeric powder. Repeat once in a day. Ginger chews are traditionally used to treat food poisoning, motion sickness, stomach flu and other types of digestive complaints. In a saucepan, combine 4 tablespoons of coconut oil and 1 ounce of fresh ginger (peeled and chopped). Warm the mixture on low heat for 20 minutes. Remove from the heat and strain out the ginger. Combine the oil, 1/2 cup of honey, 3/4 cup of sugar. Heat the mixture over medium to medium-high heat. Continue to cook until the temperature rises to 245 on a candy thermometer. Remove from the flame. Stir until the bubbling stops. Once the bubbling stops mix 12 drops of ginger essential oil and 18 drops of lemon essential oil. Spray coconut oil in a loaf pan and place a parchment paper on the bottom. Pour the solution on the prepared pan. Cut into pieces and wrap each one in a natural wax paper. Chew 1 – 2 pieces every 4 hours. Note: Recommended dosage for adults is 8 pieces per day. A ginger tincture is very easy to prepare and is a wonderful tonic for treating stomach flu, congestion, chills, nausea and motion sickness. The shelf life of this ginger tincture is 1 year. Take a jar and fill 1/2 to 3/4 of it with roughly chopped ginger. Pour vodka or brandy until the jar is almost filled. Close the lid of the jar, shake well and store in dark cabinet away from light. Leave it for 2 weeks, shaking periodically. After 2 weeks, strain the mixture and store it in a dark and cool space. Dosage: Up to 3 dropperfuls, 3 times a day for adults and 3 drops at a time and several times a day for children. Yet, it is always better to start with a lower dose. Take rest so that your body’s strength can contribute to the immune system to fight the illness. Avoid eating spicy, greasy, fatty and dairy foods. Before cooking and after using the restroom, wash your hands thoroughly. Avoid sharing and close contact with people suffering from the flu. If none of the above methods work or the problem persists for more than 3 hours a day then contact a doctor immediately. Avoid rare or raw meat. Wash the fruits and vegetables before cooking. Did you suffer from stomach flu? Which method did you use to fight it off? Share your experience, suggestions and queries in the comments section below.